This unique beveled tungsten band comes with one Cubic Zirconia stone. The middle is brushed with polished beveled edges for a unique expensive looking ring at a fraction of the price. This now comes in a 5mm Band that is shown below. Q: Hi do these rings turn your finger green after wearing? Where are you located and how long would shipping take to Amana Iowa 52203? Thank You. A: Our rings will never turn your finger green. We are located in Boston. We ship out everyday and your ring will arrive in Iowa (this goes for the rest of the Mid-West area also) in 2-4 days with free shipping. Overnight shipping, the next day. 2nd day in two days. Was this answer helpful? 18 of 20 Customer(s) found this Answer helpful. Q: Does this ring come in 8mm thickness? Thanks. Q: Does this ring come in a comfort fit? Q: yes does this ring come in 5.5mm? if we need it to get sized again where would we take it? do you have a store in Texas? This style comes in a 6mm and 8mm. We are located in Boston and ship to all over the World for free. Hope this helps! 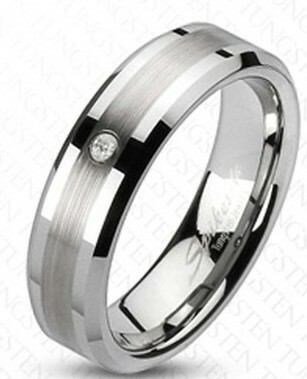 Q: What width is this standard 'Marcus Tungsten Wedding Band '? Please list all available widths for this ring. Q: Is shipping free and what kind of stones are in the rings? Q: What mm is this ring? This ring comes in a 6mm, 7mm and 8mm band. Please put the mm in the comments box at checkout. I purchased this ring for my partner for Valentine's Day. It was very impressed with the quality and weight of the ring. I will definitely recommend to friends and family and will be ordering again from Tungsten Fashions very soon! I received my new ring last week to replace an older ring. It has been great - it's very heavy/well made and looks very good and fits just right. I am impressed not only with the quality but also the speed of delivery which was only a couple days on standard shipping. I actually came upon this website through an advertising banner on something else I was looking at and looked into it. I couldn't be happier with my ring. I wanted a 2nd band to wear on vacation, doing outdoor activities, etc. and I found the perfect one. I also ordered one for my husband since he does manual labor. I ordered my ring to big. Exchange was quick and painless. Love my ring and Ive actually been wearing it more then my real wedding set. I would HIGHLY recommend these rings. Excellent quality , The fit was right on the money using the online sizing tool. I lost my wedding band and this is very close to the original. Thanks again. The picture does this ring no justice! This is a beautiful piece of jewelry. I will definitely purchase another piece soon. Ring exceeded my expectations. Very nice, compares to a very expensive ring from a Jewelry store. Looks very good and is heavy duty. My husband likes the ring. Thank you. my boyfriend loves it thank you!! This is our 3rd purchase from you guys and wanted to say thank you for this new style! It was well worth the wait - love it love it! 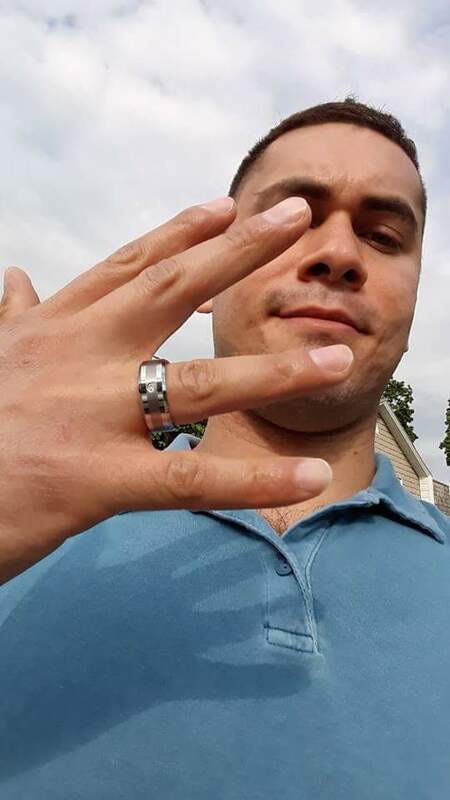 mens tungsten band with CZ stone - beautiful piece of jewelry as advertised - polished beveled edges fit is great: unbelievable pricing - have seen similar in jewelry stores for several hundreds of dollars! I ordered a ring for my wife and she loved it. Going to order one for myself too! Fabulous product. Perfect fit and it looks even better in person. High quality. 5 star recommendation!!!! Beautiful ring. True to size. Husband loved it. My husband and I love this ring. Great quality and very nice looking. Surpassed my expectations! I would buy the ring over again. Super fast service. wow ,very nice ring . thanks for the fast shipping . My boyfriend loves it! I can see even from the picture that it went pass my expectation. He said it's not bothersome to wear. Plus, customer service (Damien) was very responsive. I had no problem processing this order. May God bless the people behind this business! ? ?